A few months ago the creator of a personal website asked for permission to use excerpts from the Camp Newspaper Collections. 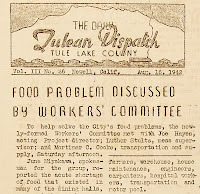 The camp papers have been a popular item ever since we introduced them into the Densho Digital Archive in 2007 with the help of a California Civil Liberties Public Education Program grant. A recent visit to the site treated me to an inspiring glimpse into what someone with an enthusiastic interest in the subject might do with the information they collect from the archive. I was delighted to find myself oblivious to time as I navigated my way through this dynamic website. The site creator is in the process of reading ALL of the camp newspapers in the Densho archive. As the camp papers are read, indexes and summaries are posted highlighting points of interest and including excerpts from the newspapers in a section titled Important Topics. A larger section of this site is devoted to extensive information about the incarceration of Japanese Americans during WWII. Exploring this section titled Japanese American Internment Camps Index Page is like spending time with a well-informed friend who wants to share their research and spark your interest about this part of American history. What you will find here is a distillation of expansive sources of information resulting in an impressive presentation of facts, essays, reviews and synopses of books and films, and document summaries, all presented by a reporter who is not shy about offering an occasional opinion on the information being shared with you. You will also find a wealthy resource of links that will help you find your way to your own particular areas of interest. Regarding citations or lack thereof in the presentation of the material, the webmaster clearly states that this is an informal site that has been created out of personal interest. People who need to cite resources are encouraged to conduct their own research and numerous links and book titles are provided, to be investigated by anyone motivated to do so.